By the time students get to middle school, or even high school, they usually know the names of persuasive language techniques. However, they still need to practice identifying and explaining them in use. These FREE worksheets will help facilitate that process. 20 Techniques of Persuasive Language: This one-page informational handout covers twenty common techniques of persuasion found in advertising, propaganda and persuasive speeches and writing. It is useful for revision and for students to keep in their notebooks. Identifying Persuasive Techniques in Advertising: This worksheet puts students’ knowledge of persuasive language to the test by requiring them to identify how techniques are used in extracts from advertisements. This is a great way for students to see the ‘everyday’ usage of these concepts. Identifying Persuasive Techniques in a Political Speech: This worksheet focuses on an extract from Winston Churchill’s speech “Blood, Toil, Tears and Sweat”. Students are required to read the extract and then complete the table, identifying the effects of the different techniques. Using Persuasive Techniques: This worksheet requires students to put their knowledge into action by writing their own persuasive sentences with the use of persuasive language techniques. 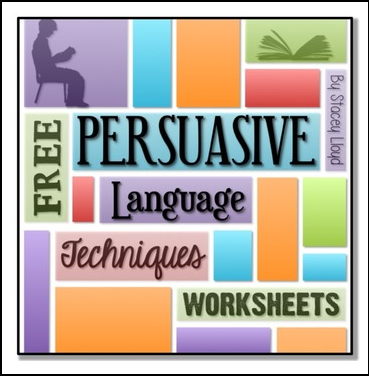 Persuasive Language: BUNDLE Save over 20% and get FIVE great products for teaching persuasive language. Figurative Language Bundle:: Check out this product for teaching figurative language.